Horse - Cassie, 16.1hh, Holsteiner mare. Schooling at Elementary Dressage. 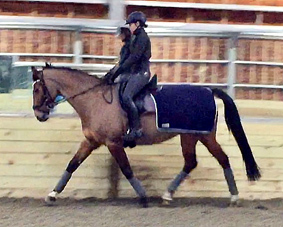 "My mare, Cassie, is quite wide and had changed shape a lot since starting work with a new trainer. My very good traditional saddler noted that our saddle wasn’t fitting well anymore, due to the resulting change in her muscle tone. Under saddle, we were having particular problems on the left rein, which I had first attributed to a problem in her mouth. After a visit from my Equine Dental Technician, he found that there were no problems with her mouth at all. Cassie also had visible muscle atrophy on one side, a lack of taking contact on left rein, and was becoming stuffy in canter." "My first impression of the SMART PRO Dressage saddle was that it was not only very light but also extremely comfortable. It came with a selection of movable blocks, both for the thigh and the knee, which I tried and chose a style that suited me. The Approved Advisor who conducted the Home Consultation Visit did not rush us and was keen to get the right saddle model and fit for both of us. Following the test ride, we opted for the try-before-you-buy rental service and were left with the girth, saddle cloth, shims and other accessories for the duration of the trial. There was no pressure to purchase the SMART PRO Dressage saddle, but after just a few days, both myself and Cassie knew we loved it! I started off on lower intensity schooling sessions (40 mins door to door with lots of warm up/down) building up to the normal hour. I noticed an instant change in that Cassie seemed more equal on both reins and was lighter in the contact - this is improving every time I ride. She also felt freer and her walk seemed (even) bigger. The medium work had considerably more power and the canter had a marked improvement on both reins. I have been able to go back to an eggbutt snaffle, which hadn't seemed 'strong' enough for a while. I also noticed that the muscle behind the saddle that I have always wanted to be stronger is starting to develop. The muscle atrophy has all but gone and rugs/massage pads no longer slip one way, which means she is becoming more equally muscled. After having ridden in the SMART PRO Dressage saddle for a while, I had my Mctimoney Chiropractor to visit. 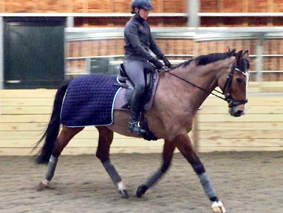 Previously, she has always found tension in Cassie's poll, neck and shoulders but since using the SMART saddle, she couldn't find any tightness in these areas at all - or in the rest of her back. I am SO glad that I made the decision to give a SMART saddle a try - there is still a slight stigma attached to them, but I can happily say, as someone who owns a lot of bling, that there absolutely shouldn't be. - I don’t know why more people aren’t thinking outside the box and giving SMART saddles a go!"